There are people who love to feel the bare surface of their phone against their fingertips, who value the looks of premium materials, quality finishes, and industrial design, who find joy in letting their gadgets collect nicks and scuffs as they age. Then there are the folks who never take their handset out of its protective case, and we cannot blame them for this – as attractively made as they are, most modern smartphones don't like being dropped and tossed around. In fact, they break quite easily, which is why the billion-dollar smartphone case industry exists. Alas, the HTC 10 isn't an exception. Although the phone looks like the child of a tank and a fighter jet, we wouldn't want to see what harm a drop on the pavement would do to it. The good news is that HTC 10 cases are already available for purchase, as the phone is being released in more and more markets worldwide. From slim and lightweight to thick and rugged, there's now a protective HTC 10 case to meet the needs of the great majority of owners. And if you're in the market for one, here are the best HTC 10 cases money can buy right now. This official HTC 10 Ice View case may be on the pricey side, but there's a good reason for this. The accessory works in unison with the phone, allowing you to access certain features without having to lift the translucent flip cover, which is neat. For instance, you can take a quick peek at the time or your most recent notifications. You may also take photos, switch between songs, or access call history, to give a few practical examples. At the same time, both the front and back of your HTC 10 are protected against damage. All of these tricks make the Ice View case the most functional on the list. It would have been great if it came in colors other than dark gray, however. Spigen's popular case design is comprised of two protective layers, hence the name. On the inside, the Neo Hybrid is made of soft polyurethane to help it absorb impact energy, while the outer rigid piece adds grip and style. There is no cover for the front, but a 1.2-millimeter raised lip provides protection for the screen against scratching when the phone is laying on flat surfaces. In addition to being tough, the case is also visually pleasing, as it is available in three color variant complementing the HTC 10's natural look. But in case you only need a lightweight piece of armor for your HTC 10, here's the Thin Fit by Spigen. 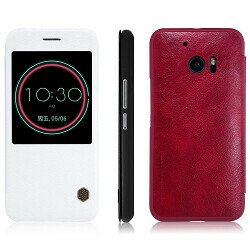 Available in mint green or dark gray, this slim polycarbonate case adds minimal bulk and weight to the phone. At the same time, its raised lip protects the screen against scratching. 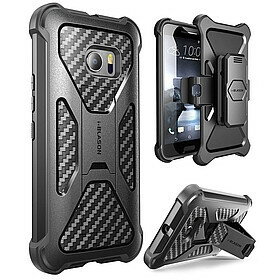 It is also a good option if you're looking for a cheap HTC 10 case that's made by a respected accessory company. Since it is one of the very few transparent HTC 10 cases, the Crystal Shell by Spigen is worthy of a mention. It protects your HTC 10 from all angles without obscuring its premium design. And it is tougher than you might think. While the back is made of rigid polycarbonate, the soft polyurethane frame with reinforced corners provides adequate protection against accidental drops. As other Spigen cases, the Crystal Shell adds a raised lip at the front to keep the screen scratch-free. It might not be the prettiest case out there, but it should get the job done if you need a tough HTC 10 case that's also convenient for every-day use. The DualPro case by Incipio is made of two pieces, each with its own protective properties. On the outside, a rigid layer with soft-touch finish provides grip and comfort, while a softer inner piece protects against more serious bumps and hits. Plus, the case is also available in pink! This case combines style with function by protecting the rear and sides of your HTC 10, all while leaving the back side exposed in all its beauty. Material-wise, the bumper is textured and made of soft, impact-absorbing material. The frosted transparent back, on the other hand, is rigid and flexible. Gray and pink color versions are also available. It is a bold claim indeed, but the Evo Check may be well fit for it. This tough HTC 10 case is designed to endure drops from 6.6 feet (2 meters) without being overly bulky or unattractive. In fact, its translucent mesh design looks quite nice. On the downside, the Evo Check is relatively expensive and doesn't come in any other colors. At this price, the Seidio Surface is a great value-driven proposition. It is durable and comfortable to handle without being overly thick, it has a soft finish making it pleasant to touch, and it even has a built-in kickstand that snaps closed by a magnet when not in use. Color options include black, gold, and red. 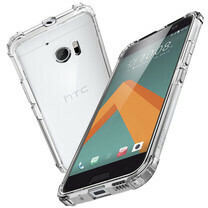 26 October 15 of the best cases for the HTC 10: from slim to super-armored The HTC 10 has been out for a while now. And while the metal-clad phone has a bold, macho-like, sturdy look to it, you'd be forgiven if you feel the need to slap a case on it now and again when you want to avoid any accidents. What case, you might ask? Original is probably nicest of all but give me a break $49.99! If I get a case for my 10 (plan on body skin for now), it will be a Cruzerlite Bugdroid Circuit. Since Element, Evutec, and the rest of the carbon fiber/aluminum high-end case makers tend to eschew anything other than Apple and Samsung, I tend to buy something that looks kind of cool but is inexpensive when I'm not carrying an iPhone or Galaxy. The Cruzerlite Bugdroid Circuit or XDA SE has been on every HTC and LG I have owned, and they have survived. Ok, so most of these cases are pretty boring and uninspired. I'm just going to rock my 10 without a case.